Hand-assisted laparoscopic nephroureterectomy has been advocated by some (19-22), because it provides the surgeon with tactile sensation and an incision adequate for intact specimen removal. Herein, we present two hand-assisted laparoscopic nephroureterectomy techniques. Gonzalez et al. described making a midline, periumbilical incision, which was used as the hand-assisted port (20). Prior to the dissection of the kidney, two large clips were placed on the proximal ureter to prevent any potential tumor spillage during nephrectomy. For the distal ureter, a suprapubic 10-mm laparoscopic trocar is placed, and a 24-French nephroscope is placed through the trocar. The distal ureter is resected using a Collins knife, with the aid of the surgeon's hand to elevate the ipsilateral hemitrigone into view. Once the bladder cuff is free, the surgeon's hand was used to remove the specimen intact (Fig. 4). Neither the suprapubic cystotomy nor the bladder cuff resection site was closed with suture. Foley catheter was removed by day 10 postoperatively. The advantages with this technique are that because it is hand assisted, only one trocar site is necessary transvesically to resect the bladder cuff. No patient repositioning is necessary for a transurethral procedure. However, because the authors report only one case of this method, the oncologic efficacy of this technique is not evaluated. 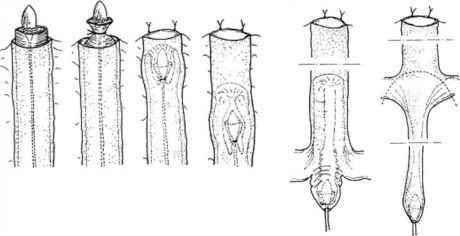 FIGURE3 ■ (A) "Intussusception" technique demonstrating the ureter which is sectioned below the ureteropelvic junction. The tip of the catheter is tied to the proper ureter and later intussuscepted when the catheter is pulled out. (B) The catheter is retracted on a light tension until the ureter is totally everted in a tent fashion. A transurethral resection is then performed around the everted ureteral orifice. The most important issue for the management of the distal bladder cuff is its oncologic efficacy. Another similar method utilizing a modification of the pluck technique was introduced by Wong and Leveillee (21). The ureter is clipped and dissected distal to the intramural hiatus prior to any kidney dissection. 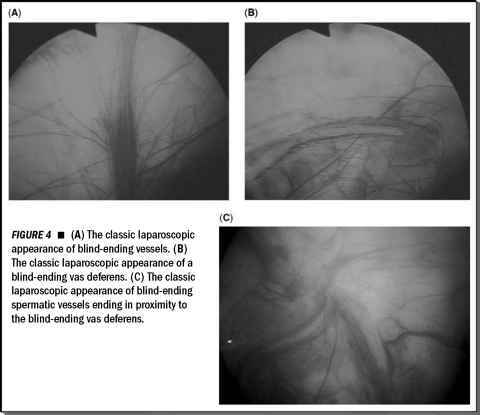 A transperitoneal hand-assisted laparoscopic nephroureterectomyis then performed. Subsequently, by placing the ureter on tension with the surgeon's hand, the remaining ureteral dissection is performed transurethrally with a Collins knife. The complete specimen is then removed en bloc through the hand port. Again, the bladder is not closed, and a cystogram is performed on the seventh postoperative day; if it is normal, the catheter is removed. The authors recently presented a mean follow-up of 13.2 months on 27 patients (22). Ten patients have had intravesical recurrences (37%) and no retroperitoneal recurrence was noted. The advantage to this approach is that no additional incision is made to resect the distal ureter and the bladder cuff. Further, the authors describe a modified dorsal lithotomy position where the laparoscopic and transurethral surgeries can be performed simultaneously without repositioning (Fig. 5). The theoretical risk of tumor spillage/seeding from the resected ureter is minimized because the distal ureter is clipped prior to any kidney dissection. The disadvantages of this procedure can also be associated with those of the pluck technique. The bladder is left open to heal by secondary intention. Although not mentioned in the authors' description, the simultaneous laparoscopic and transurethral procedures likely presents with technical difficulty during surgery. Although each one of the above mentioned techniques has its advantages, they all present with their own shortcomings. Technical shortcomings include incomplete resection of the ureteral orifice, tumor spillage, an open bladder left to heal by secondary intention, exposed staples, trapped mucosa within staple lines, leaking trocars, and time-consuming patient repositioning/draping. The most important issue for the management of the distal bladder cuff is its oncologic efficacy. In a review of the world literature, selected series of laparoscopic nephroureterec-tomy are outlined in Table 1. The mean follow-up ranged from 11.1 to 32.9 months with the bladder recurrence rate ranging from 10.5% to 50% (12,15,17,19,22,25,26). Although this is comparable to the well-published rates of 21% to 23% in the open series (23,24), more studies with a longer follow-up and a larger number of patients are needed to demonstrate adequate cancer control of the various modalities in distal ureter treatment. For this and the fact that urothelial carcinoma is an aggressive tumor, we still advocate an open Gibson incision with the standard approach of transvesical bladder cuff resection, following a laparoscopic nephrectomy. Through this incision we remove the intact specimen, including the kidney, ureter, and the bladder cuff.